Blake graduated from Wofford College in Spartanburg, South Carolina, where he earned a Bachelor’s Degree in Economics. 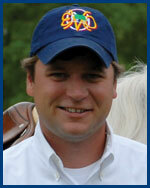 He's a licensed agent with EMO Agency, Inc., one of the country's top equine and farm insurance companies. At the age of 7, Blake owned a gray Quarter Horse named Dusty who commanded all of his attention; together, they ruled a small horse farm in South Carolina. Blake’s love for horses has never faded, and he's now following his dream where horses are the center of his livelihood. He also enjoys traveling the show circuit with his wife and daughters, Elle and Elizabeth Adeline.